We are mentors for the production of classy Cylinder Liners. Our cylinder liners have been highly appreciated in the global market because of their tremendous caliber to hold in harsh conditions. That is why we are listed amongst world-class centrifugal cylinder liners exporters in India. 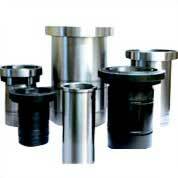 Cylinder Liners and Blocks are made from centrifugally casted, shell casted with close grained cast iron. Cylinder liners are duly heat treated. Cylinder bores are cross honned and diameters are properly ground finished to achieve the highest level of accuracy.